Western blot analysis of cell extracts from various cell lines, using Acetyl-CoA Carboxylase (C83B10) Rabbit mAb. Western blot analysis of extracts from NIH/3T3 and 3T3-L1 cells using Adiponectin (C45B10) Rabbit mAb. 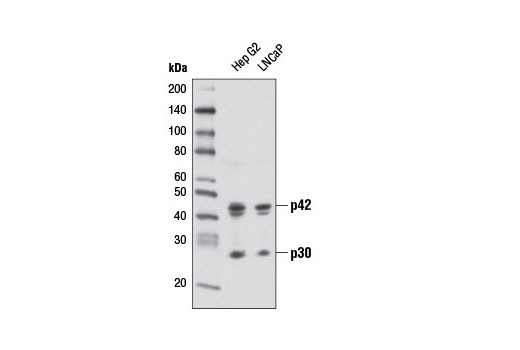 Western blot analysis of extracts from Hep G2 and LNCaP cells using C/EBPα (D56F10) XP® Rabbit mAb. 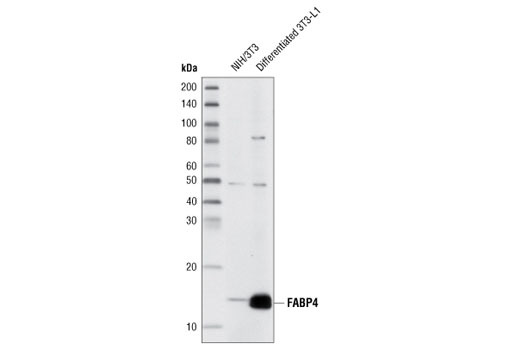 Western blot analysis of extracts from NIH/3T3 and differentiated 3T3-L1 cells using FABP4 (D25B3) XP® Rabbit mAb. Western blot analysis of extracts from various cell types using Fatty Acid Synthase (C20G5) Rabbit mAb. 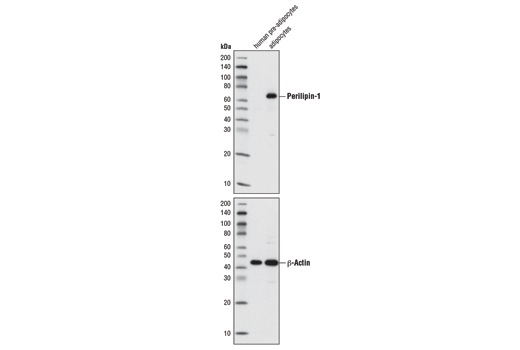 Western blot analysis of extracts from human pre-adipocytes and adipocytes using Perilipin-1 (D1D8) XP® Rabbit mAb (upper) and β-Actin Antibody #4967 (lower). 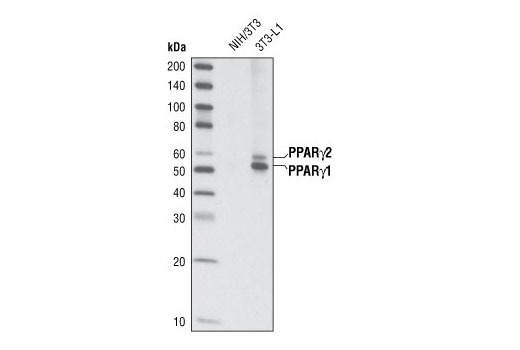 Western blot analysis of extracts from NIH/3T3 and 3T3-L1 cells (differentiated 6 days) using PPARγ (C26H12) Rabbit mAb. Immunoprecipitation of Acetyl-CoA Carboxylase from HeLa cell extracts. Lane 1 is 10% input, lane 2 is Rabbit (DA1E) mAb IgG XP® Isotype Control #3900, and lane 3 is Acetyl-CoA Carboxylase (C83B10) Rabbit mAb. 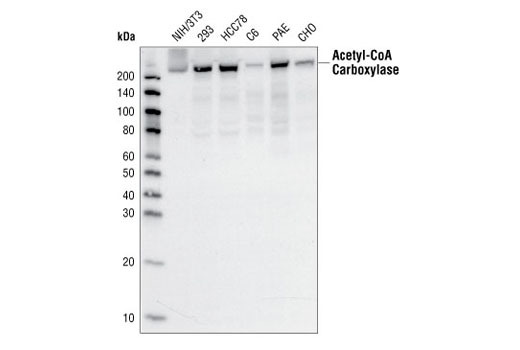 Western blot was performed using Acetyl-CoA Carboxylase (C83B10) Rabbit mAb. 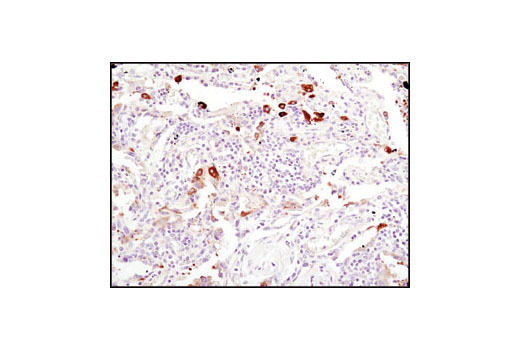 Immunohistochemical analysis of paraffin-embedded mouse lung using C/EBPα (D56F10) XP® Rabbit mAb. 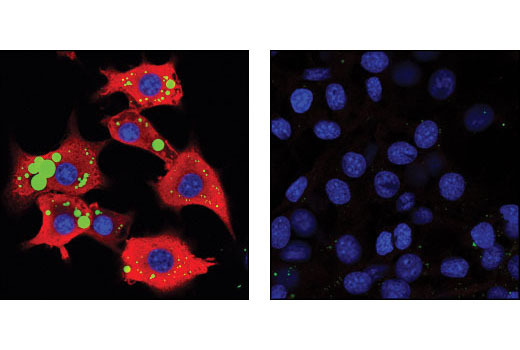 Confocal immunofluorescent analysis of differentiated 3T3-L1 cells (left) and undifferentiated 3T3-L1 cells (right), using FABP4 (D25B3) XP® Rabbit mAb (red). Lipid droplets have been labeled with BODIPY 493/503 (green). Blue pseudocolor = DRAQ5® #4084 (fluorescent DNA dye). 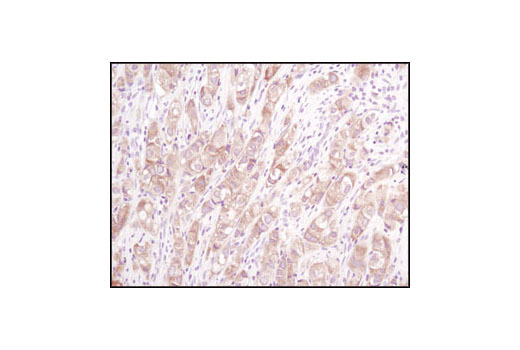 Immunohistochemical analysis of paraffin-embedded breast carcinoma using Fatty Acid Synthase (C20G5) Rabbit mAb. 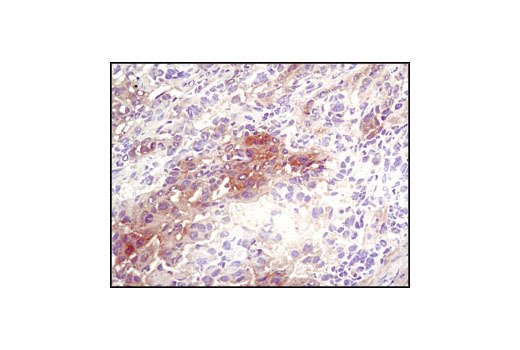 Immunohistochemical analysis of paraffin-embedded breast carcinoma using Perilipin-1 (D1D8) XP® Rabbit mAb. Note specific staining of adipocytes. 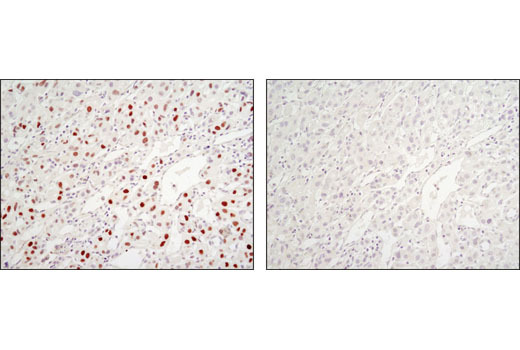 Immunohistochemical analysis of 3T3-L1 cells, undifferentiated (left) or differentiated (right) , using PPARγ (C26H12) Rabbit mAb. 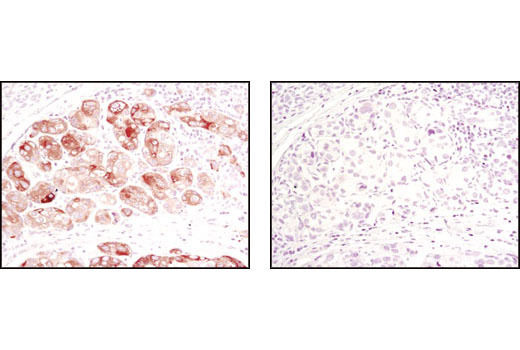 Immunohistochemical analysis of paraffin-embedded human breast carcinoma using Acetyl-CoA Carboxylase (C83B10) Rabbit mAb in the presence of control peptide (left) or Acetyl-CoA Carboxylase (C83B10) Blocking Peptide #1062 (right). 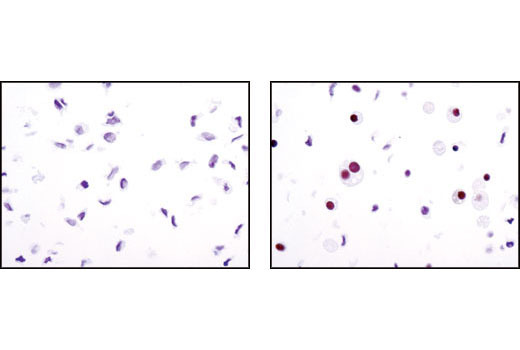 Immunohistochemical analysis of paraffin-embedded cell pellets, THP-1 (left) or Jurkat (right), using C/EBPα (D56F10) XP® Rabbit mAb. 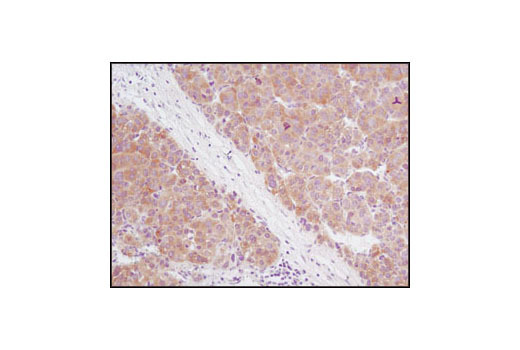 Immunohistochemical analysis of paraffin-embedded hepatocellular carcinoma using Fatty Acid Synthase (C20G5) Rabbit mAb. 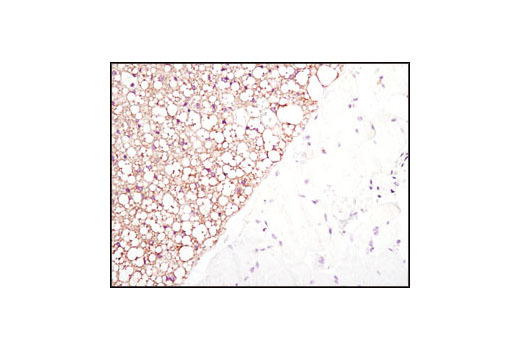 Immunohistochemical analysis of parafin-embedded mouse brown fat using Perilipin-1 (D1D8) XP® Rabbit mAb in the presence of control peptide (left) or antigen-specific peptide (right). 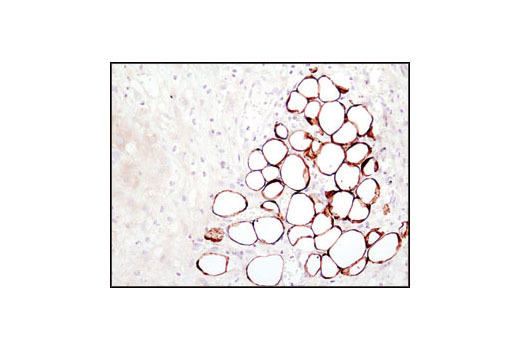 Immunohistochemical analysis of paraffin-embedded mouse brown fat using PPARγ (C26H12) Rabbit mAb. 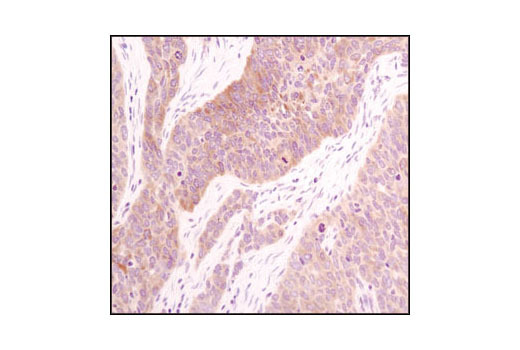 Immunohistochemical analysis of paraffin-embedded human breast carcinoma, using Acetyl-CoA Carboxylase (C83B10) Rabbit mAb. 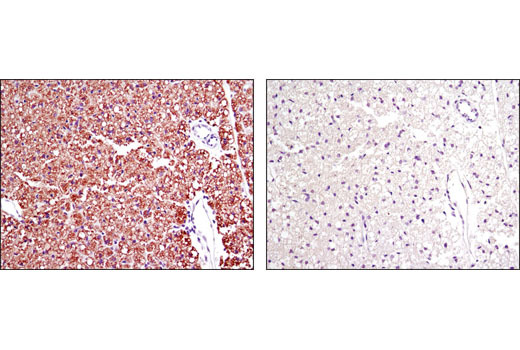 Immunohistochemical analysis of paraffin-embedded human hepatocellular carcinoma using C/EBPα (D56F10) XP® Rabbit mAb in the presence of control peptide (left) or antigen-specific peptide (right). 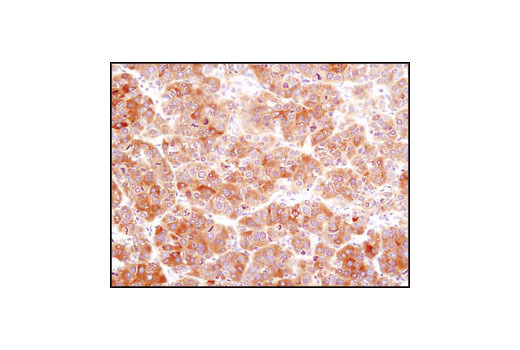 Immunohistochemical analysis of paraffin-embedded lung carcinoma using Fatty Acid Synthase (C20G5) Rabbit mAb. 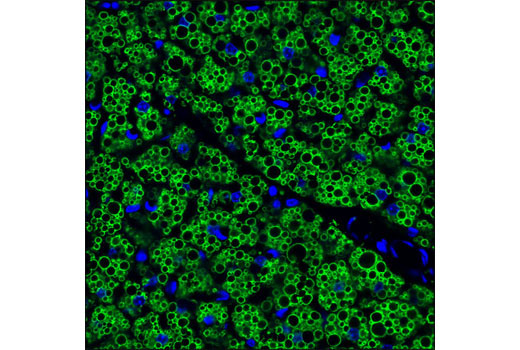 Confocal immunofluorescent analysis of 8-day differentiated 3T3-L1 cells, using Perilipin (D1D8) Rabbit mAb (green). Blue pseudocolor = DRAQ5® #4084 (fluorescent DNA dye). 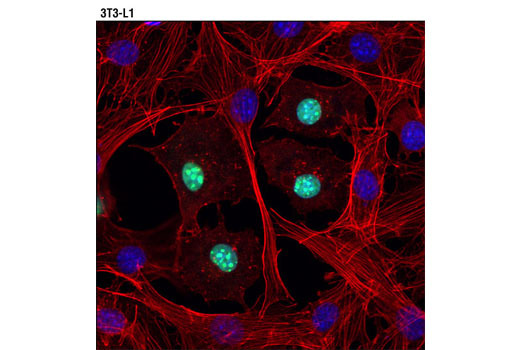 Confocal immunofluorescent analysis of 3T3-L1 cells using PPARγ (C26H12A8) Rabbit mAb (red) showing nuclear localization in differentiated cells. Lipid droplets have been labeled with BODIPY 493/503 (green). Blue pseudocolor = DRAQ5™ (fluorescent DNA dye). 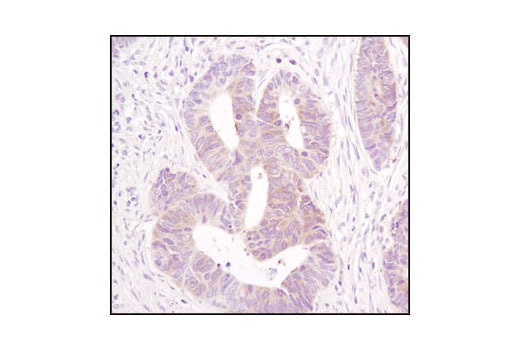 Immunohistochemical analysis of paraffin-embedded human colon carcinoma using Acetyl-CoA Carboxylase (C83B10) Rabbit mAb. 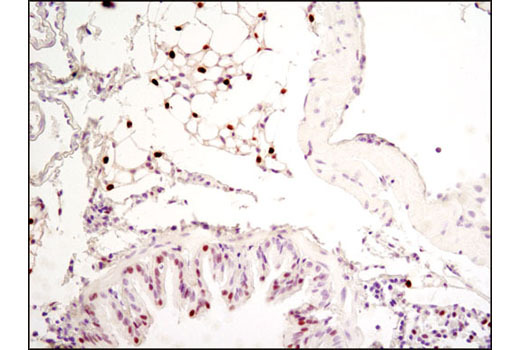 Immunohistochemical analysis of paraffin-embedded human tonsil using C/EBPα (D56F10) XP® Rabbit mAb. Immunohistochemical analysis of paraffin-embedded lymphoma, showing staining of adipocytes, using Fatty Acid Synthase (C20G5) Rabbit mAb. Confocal immunofluorescent analysis of frozen mouse brown adipose tissue using Perilipin-1 (D1D8) XP® Rabbit mAb (green). Blue pseudocolor = DRAQ5® #4084 (fluorescent DNA dye). 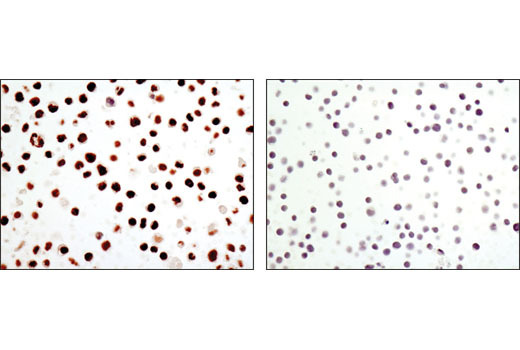 Chromatin immunoprecipitations were performed with cross-linked chromatin from HDLM-2 cells and either PPARγ (C26H12) Rabbit mAb or Normal Rabbit IgG #2729 using SimpleChIP® Plus Enzymatic Chromatin IP Kit (Magnetic Beads) #9005. The enriched DNA was quantified by real-time PCR using SimpleChIP® Human FOXN3 Intron 3 Primers #95568, human STON2 intron 4 primers, and SimpleChIP® Human α Satellite Repeat Primers #4486. The amount of immunoprecipitated DNA in each sample is represented as signal relative to the total amount of input chromatin, which is equivalent to one. 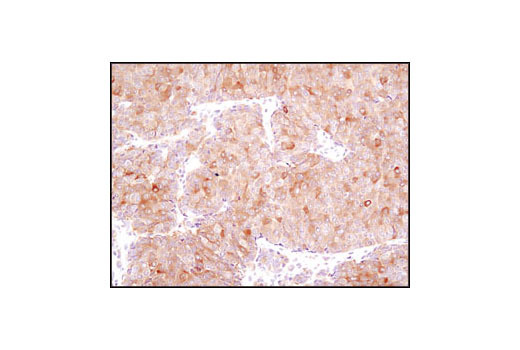 Immunohistochemical analysis of paraffin-embedded human hepatocellular carcinoma, using Acetyl-CoA Carboxylase (C83B10) Rabbit mAb. 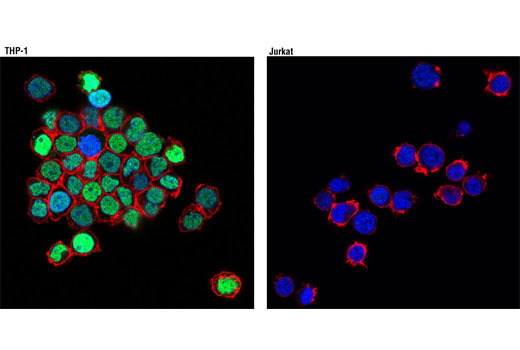 Confocal immunofluorescent analysis of THP-1 (left) and Jurkat (right) cells using C/EBPα (D56F10) XP® Rabbit mAb (green). Actin filaments were labeled with DY-554 phalloidin (red). Blue pseudocolor = DRAQ5® #4084 (fluorescent DNA dye). 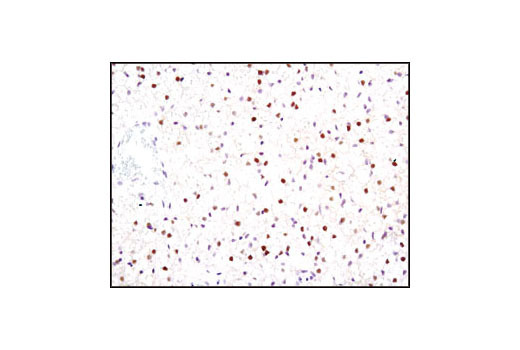 Immunohistochemical analysis of paraffin-embedded mouse brown fat using Fatty Acid Synthase (C20G5) Rabbit mAb. 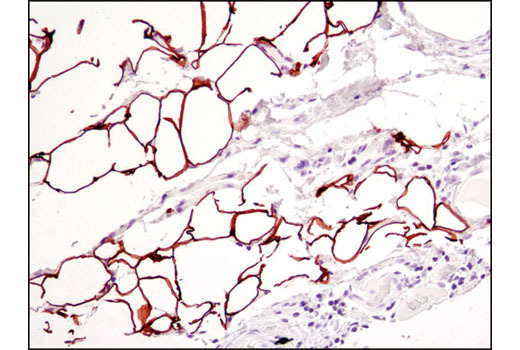 Immunohistochemical analysis of paraffin-embedded human lung carcinoma using Acetyl-CoA Carboxylase (C83B10) Rabbit mAb. 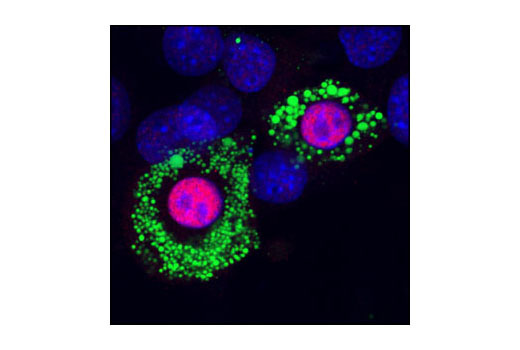 Confocal immunofluorescent analysis of differentiated 3T3-L1 cells using C/EBPα (D56F10) XP® Rabbit mAb (green). Actin filaments were labeled with DY-554 phalloidin (red). Blue pseudocolor = DRAQ5® #4084 (fluorescent DNA dye). 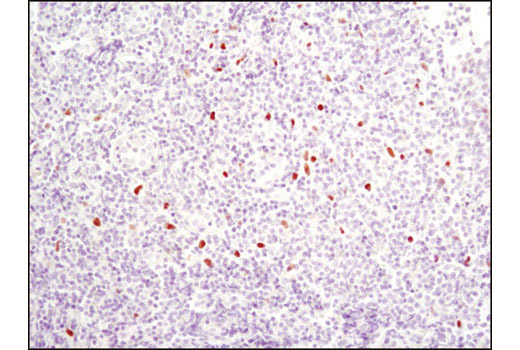 Immunohistochemical analysis of frozen SKOV-3 xenograft using Fatty Acid Synthase (C20G5) Rabbit mAb. Flow cytometric analysis of 293 cells, using Acetyl-CoA Carboxylase (C83B10) Rb mAb (blue) compared to a nonspecific negative control antibody (red). 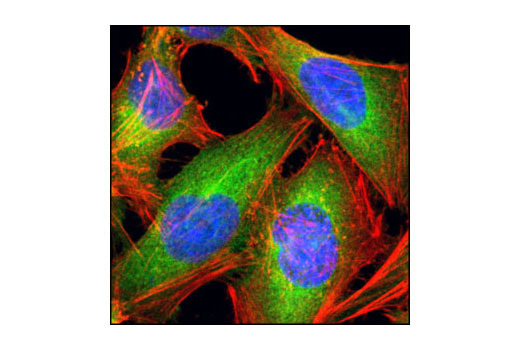 Confocal immunofluorescent analysis of HeLa cells using Fatty Acid Synthase (C20G5) Rabbit mAb (green). Actin filaments have been labeled with DY-554 phalloidin (red). Blue pseudocolor = DRAQ5™ (fluorescent DNA dye). 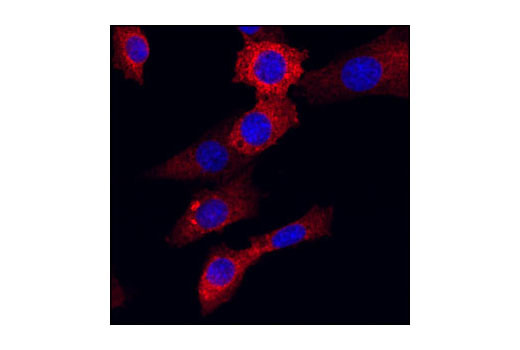 Confocal immunofluorescent analysis of NIH/3T3 cells labeled with Acetyl-CoA Carboxylase (C83B10) Rabbit mAb (red). Blue pseudocolor=Draq5™ (fluorescent DNA dye). The Adipogenesis Marker Antibody Sampler Kit provides an economical means to evaluate proteins involved in the regulation of adipogenesis. The kit includes enough antibody to perform two western blot experiments with each primary antibody. Each antibody recognizes endogenous total levels of its specific target protein. 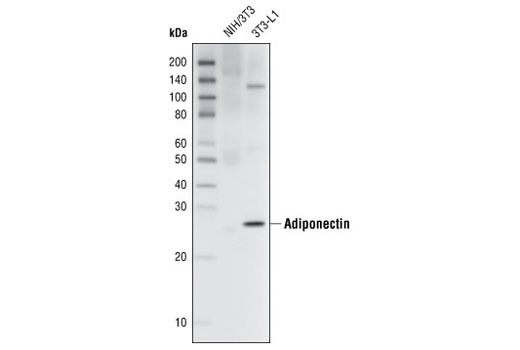 The Adiponectin (C45B10) Rabbit mAb detects endogenous levels of total adiponectin protein monomer. It will not detect higher molecular weight forms of adiponectin. 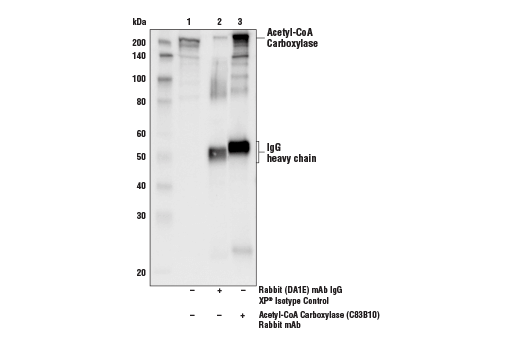 The Acetyl-CoA Carboxylase (C83B10) Rabbit mAb detects endogenous levels of all isoforms of acetyl-CoA carboxylase protein. 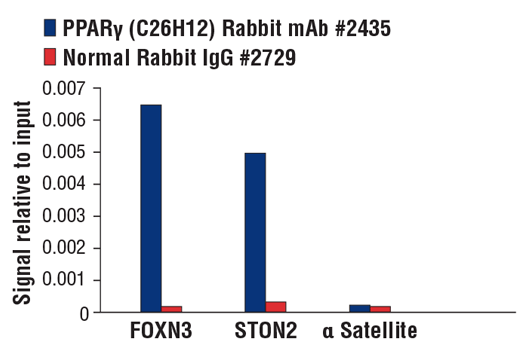 The FABP4 (D25B3) XP® Rabbit mAb may cross react with other FABP family members. Monoclonal antibodies are produced by immunizing animals with a synthetic peptide corresponding to residues surrounding Ser523 of human acetyl-CoA carboxylase α1, to human adiponectin, to the sequence of human FABP4, to residues surrounding Gly46 of human fatty acid synthase, to residues surrounding Ile419 of human perilipin/perilipin-1 protein, to residues surrounding Ala176 of human C/EBPα protein, or to residues surrounding Asp69 of human PPARγ. Adipocytes are the primary cellular component of adipose tissue and play a key role in the storage of triacylglycerol. Adipogenesis is the cellular process where preadipocytes differentiate into adipocytes. Fatty acid binding proteins (FABPs) act as cytoplasmic lipid chaperones by binding fatty acids and lipids for transport to various cellular pathways (1,2). 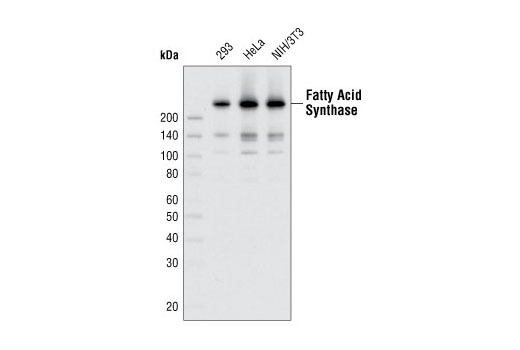 The predominant fatty acid binding protein found in adipocytes is FABP4. Adiponectin is an adipokine expressed exclusively in brown and white adipocytes and is secreted into the blood. It exists in three major forms: a low molecular weight trimer, a medium molecular weight hexamer and a high molecular weight multimer (3). Decreased adiponectin levels are seen in obese and insulin-resistant mice and humans (4), suggesting that this adipokine is critical for maintenance of insulin sensitivity. Peroxisome proliferator-activated receptor γ (PPARγ) is a transcriptional activator preferentially expressed in adipocytes, vascular smooth muscle cells, and macrophages (5,6). Acetyl-CoA carboxylase (ACC) is a key fatty acid biosynthesis and oxidation enzyme that is responsible for the carboxylation of acetyl-CoA to malonyl-CoA, (7). Phosphorylation of acetyl-CoA carboxylase by AMPK at Ser79 or by PKA at Ser1200 inhibits ACC enzymatic activity (8). ACC is a potential target of anti-obesity drugs (9,10). CCAAT/enhancer-binding proteins (C/EBPs) transcription factors are critical for cellular differentiation, terminal function, and the inflammatory response (11). Phosphorylation of C/EBPα at Thr222, Thr226, and Ser230 by GSK-3 may be required for adipogenesis (12). Perilipin localizes to the periphery of lipid droplets and serves as a protective coating against lipases. Evidence suggests that PKA regulates lipolysis by phosphorylating perilipin (13-17), resulting in a conformational change that exposes lipid droplets to endogenous, hormone-sensitive lipases (14). Hence, perilipin plays a pivotal role in lipid storage (14,17). Fatty acid synthase (FASN) catalyzes the synthesis of long-chain fatty acids from acetyl-CoA and malonyl-CoA. FASN is active as a homodimer with seven different catalytic activities and produces lipids in the liver for export to metabolically active tissues or storage in adipose tissue. In most other human tissues, FASN is minimally expressed since they rely on circulating fatty acids for new structural lipid synthesis (18). Tuncman, G. et al. (2006) Proc Natl Acad Sci U S A 103, 6970-5. 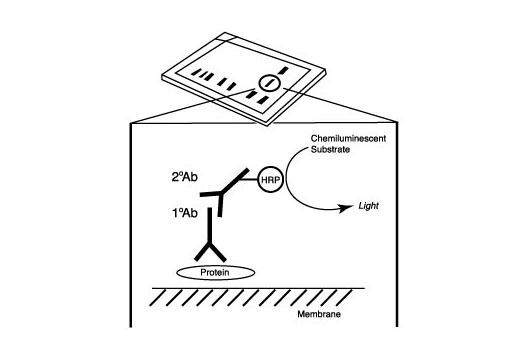 Haunerland, N.H. and Spener, F. (2004) Prog Lipid Res 43, 328-49. Lekstrom-Himes, J. and Xanthopoulos, K.G. (1998) J Biol Chem 273, 28545-8. Katsurada, A. et al. (1990) Eur J Biochem 190, 427-33. Kadowaki, T. et al. (2006) J Clin Invest 116, 1784-92. Hu, E. et al. (1996) J Biol Chem 271, 10697-703. Ross, S.E. et al. (1999) Mol Cell Biol 19, 8433-41. Tontonoz, P. et al. (1995) Curr Opin Genet Dev 5, 571-6. Rosen, E.D. et al. (1999) Mol Cell 4, 611-7. Greenberg, A.S. et al. (1991) J Biol Chem 266, 11341-6. Brasaemle, D.L. (2007) J Lipid Res 48, 2547-59. Ducharme, N.A. and Bickel, P.E. (2008) Endocrinology 149, 942-9. Egan, J.J. et al. (1990) J Biol Chem 265, 18769-75. Brasaemle, D.L. et al. (2009) Mol Cell Biochem 326, 15-21.